« Two Particles Enter, No Particles Leave! Advice for bloggers from The Oatmeal. Click to read the whole comic (language is not for the Victorian-minded). I was reading the hilariously vulgar comic strip The Oatmeal on Saturday, as is my habit. Within the strip, the artist challenged all of us to greater levels of awesomeness: painting, sing-along videos, and cage-matches with nuns were mentioned, which aren’t really my thing. (Well, sing-along videos aren’t entirely ruled out for the future.) However, the most normal of his suggestions is completely in line not only with this blog, but with the theme of Moonday: why the Sun and Moon appear to be nearly the same size in the sky. That apparent similarity in size is frankly a strange coincidence: we know the Sun is a lot bigger than the Moon. However, it’s also a lot farther away, and therein lies the coincidence: the two factors almost perfectly cancel each other out, which enables events such as solar eclipses. Lest you think there is some deeper significance than coincidence at work, though, the size match isn’t perfect—both Earth’s orbit around the Sun and the Moon’s orbit around Earth are elliptical, so sometimes the Moon will appear to be slightly smaller than the Sun’s disc. Solar eclipses during those times are called annular eclipses, because a ring of the Sun is still visible around the Moon. Having covered the short version, let’s see exactly how things work out the way they do. Put simply, it’s a matter of perspective. Imagine a Solar System where the Moon and Sun aren’t hugely different in size, but where the Sun has only 3 times the diameter of the Moon. Since the average distance between the Earth and Sun is 1 astronomical unit (AU), let’s call the distance from Earth to the Moon “1 Moon unit” (MU), and the diameter of the Moon “1 zappa”. As the figure on the left shows, we can draw a triangle with Earth at one vertex and the Moon as the base. The apparent size of the Moon is the angle at the vertex where we are. (The size of Earth is irrelevant, since what matters is actually the size of a human eye—which is obviously far too small to worry about!) In this toy Solar System, the Sun is 3 zappas in diameter, so all we need to do to make it appear the size of the Moon is to add to the triangle without changing its angle. When the triangle is big enough that the Sun fits in the base, that’s the distance it needs to be from Earth—and that number is precisely 3 MU. This is basic geometry, which you may remember from high school, and we can go far with it. If the Sun is 20 times bigger than the Moon, than it must be 20 times farther away to appear the same size. 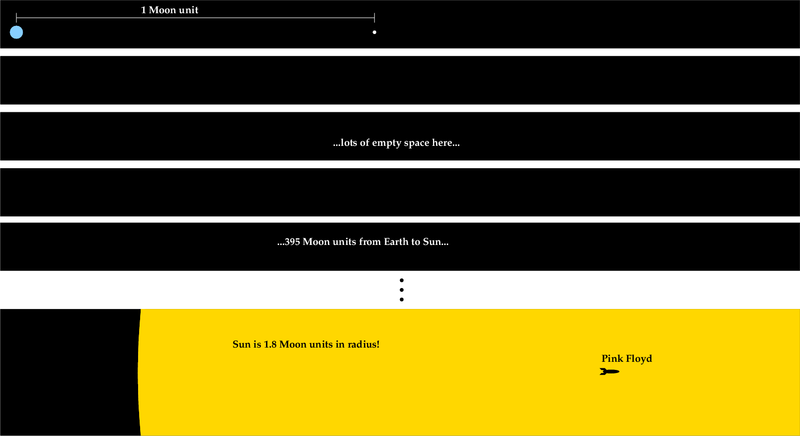 In the real Solar System, the Sun is 412 times the size of the Moon (412 zappas in diameter), and it is 395 times farther away from Earth (395 MU) on average, with a bit of variation due to the eccentricities of orbit. Therefore, the Sun generally appears very slightly larger than the Moon in the sky, but the difference in appearance is small enough to be insignificant most of the time. Because the Sun is so huge and so bright, many people are surprised to learn that it still appears pretty small compared to the whole sky. If you imagine the sky as a dome 180° from horizon to horizon, the Sun and Moon appear to be only about 0.5° in diameter, which is smaller than your thumb held at arm’s length. Of course, the explanation I’ve written here could still be consistent with significance beyond coincidence. However, there’s one more bit of information: according to our best theory, the Moon was formed when a large body collided with Earth in the very early Solar System, tearing off a large portion. After the Moon cooled and things calmed down, it was a lot closer to Earth than it is now, and rotated on its axis more quickly. Over time, the complex tidal interactions between Earth and Moon slowed the Moon’s rotation (and Earth’s! ), all the while causing the Moon to move away slowly. Today, the rate at which the Moon is moving away from Earth is about 3 millimeters per year, hardly a dramatic increase, but billions of years ago, the rate was higher. To put it plainly, we see the Moon as being the same size as the Sun because of when we live. If we were living two billion years in the future or two billion years in the past, we wouldn’t be having this discussion: the Moon and Sun wouldn’t be close to the same apparent size. While the apparent similarity in size is a coincidence in the truest sense, it’s still interesting. What would be different in human cultures over time if this coincidence didn’t exist? Great post! I hadn’t really thought about why they are the same size at all.